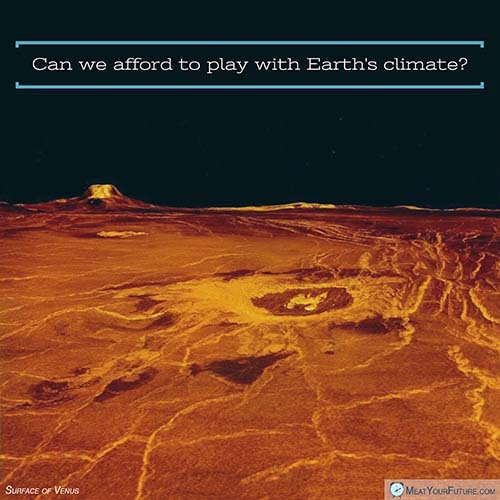 Can We Afford to Play with Earth's Climate? What can we learn from Venus and Mars? Can We Afford to Play with Earth’s Climate? Our two closest planetary neighbors, Venus and Mars, were once thought to have Earth-like climates in the distant past. But, a hospitable climate is not guaranteed forever. Today, temperatures on Venus can reach a blistering 864° F, while on Mars they can plummet to a frigid -195° F.
Our neighbors’ now inhospitable climates should remind us of how very fortunate we are, and also motivate us to do everything within our power to preserve and avoid destroying the environment that supports us here on Earth. The consumption of animal foods, in particular, is both (1) a significant driver of numerous devastating and converging environmental problems (including climate change), and (2) the easiest and one of the most beneficial things we can all stop consuming, right now. In fact, it will become increasingly impractical, if not impossible, to adequately or timely address climate change, deforestation, loss of biodiversity, ocean dead zones, and the other dire environmental challenges of our time, unless we see an urgent and massive global shift away from animal foods. Please go vegan to help preserve and restore our environment, and to remove your support from the needless killing of billions of sentient animals.